There are no in-person classes for 2015 and 2016 while HouseHeal is in an important development phase (exciting!) – stay tuned! If you have read Sara’s book and are eager to get in to action, Sara is still available for individual coaching by phone (amazingly powerful!!). 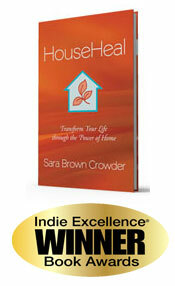 You can contact Sara at sara@househeal.com. 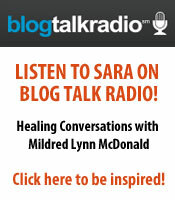 The HouseHeal teaching started out as a 2-hour workshop. That basic workshop was very well-received by participants (I still get notes from people telling me how much it has stayed with them) but I saw quickly that for people to make level of shift that is possible, they needed more time to really get the principles and learn to apply them every day. So I came up with a full-day workshop that allowed for more personal work. The problem was that by noon people were so full of ideas that they wanted to run home and start doing things. HouseHeal moves you in to action, which is great, but without an immediate outlet for activity, people could absorb only so much at once. So I took another step back. I knew I had very powerful teaching in my hands, but I needed a format that did it justice and served people best. I knew the learning had to come in layers and that people needed ongoing support. I took a year away from teaching, finished writing my book, and developed this new 4-part course which, in my opinion, is one of the most powerful personal transformation courses in existence. I believe that the 4-part HouseHeal series is the most efficient and effective way to learn your own power at home – and beyond – and once you experience it for yourself I think you will agree. I am interested in the HouseHeal into Practice course but the money is just not possible for me right now. Is there any other pricing option? Part of the HouseHeal teaching is about getting money flowing in your life. If registration is a challenge for you right now, there are amazing things for you still to learn about your own power. You are way more powerful than the already low fee! Once you take this course, you will look back and smile that you ever hesitated about the price. If you want to come to the course, decide, and you will find a way to do it. The HouseHeal teaching is life-changing, but it is for people who are ready. The real question is – are you truly ready to make changes in your home and in your life? Note: There are lots of free resources here on this web site – and also be sure you are signed up on the HouseHeal email list to get inspiring messages and notice of free teleseminars! I want to take this course but my partner/spouse is not interested. Is it worth it for me sign up on my own when my partner is part of the problem at home? One of the things you will learn in the course is that you are in charge of your life, no matter who else is in it and no matter who else is making decisions with you. The first step is for you to find your own clarity and your own power, and go from there. It’s great if couples take the course together but, honestly, whether your partner comes along with you or not will not affect the benefits that you receive from the teaching. In fact, you may just find that after the course, living with your partner is easier than ever before! I am not really interested in all that touchy-feely stuff and personal growth. I really just to make some décor decisions, get organized and get some projects done around the house. Will I be able to relate to the course? The principles woven into the teaching are at work in your life whether you believe in them or not. I do not try to convince of anything, I just help you to notice things for yourself, and get into action. If you are open to learning, you will relate to the course, and get the results you are looking for. Funnily enough I have found that people who do not have a prior interest in personal or spiritual growth have the easiest time diving right in! I don’t really have any major issues at home – things are actually pretty good. What benefit is there to me in taking the course if I don’t feel like I need anything? The course will help you to understand that wanting more does not meant that there is something wrong with what you have right now. In fact, appreciating what you have now is essential to moving forward. The thing to recognize is that change in your home is constant. Over time, the look and feel of your home will change and it will either get progressively better or progressively worse. If you want your home to keep getting better from here, this course will help you even if things are already pretty good right now. Listen to your intuition – you will know. Chances are, if you are asking the question, there is likely something here for you. What if I take the course and don’t experience any changes? I am so confident of the power of this teaching that I guarantee the course completely. If you finish all 4 modules and do not notice a difference in you and your home, I will give you your money back. It’s as simple as that.